A couple months ago I was fortunate to meet Annie through mutual Facebook friends. I quickly realized we shared a mutual love of fashion, had a passion for animals and more importantly, an immense love for FOOD! When Annie started her blog 'Meet the Shannon's', I was beyond stoked. It was a relief to know I wasn't the only one who could strangely relate to the movie Julie and Julia. About a year ago my husband and I came up with the idea to open up an all vegan cinnamon roll shop (opens this July in Berkeley, CA!) 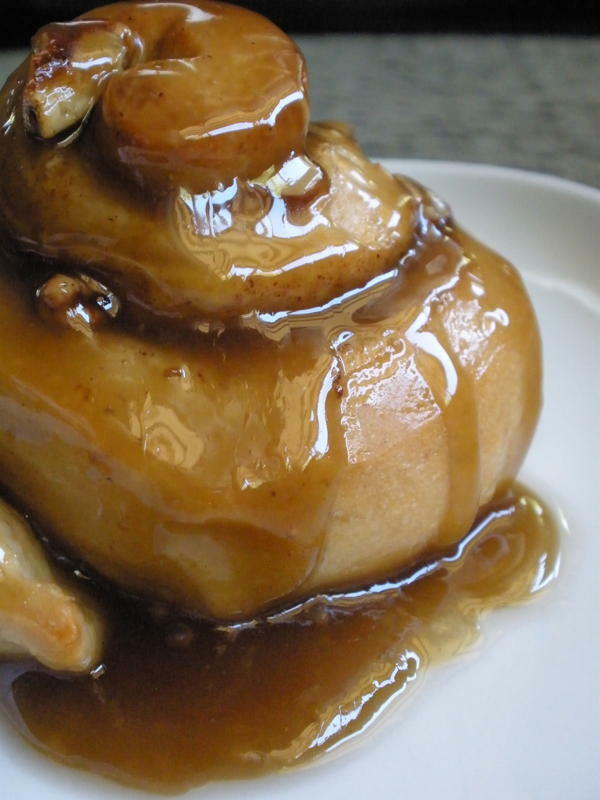 As I read through her recipes, of course, the caramel sticky rolls stood out. The challenge was on! I followed the majority of the instructions on Annie's blog for the most part. I found the dough to be much tougher when kneading it than the dough I'm used to working with. This, however, made the dough very easy to handle as far as rolling went. Skeptical, I pressed on. When it came to making the caramel sauce, I realized I was out of powdered sugar. Crap. I substituted regular cane sugar instead. The first time I boiled it and let it cool, the margarine separated from the sugar. I boiled it a second time and it blended just fine. I also added a half teaspoon of Madagascar vanilla bourbon extract for extra flavor once I removed it from the heat. YUM. Much to my dismay, I realized I was out of cranberries for the filling as well. I ended up using a half cup of crushed pieces of sweet, candied pecans instead. I also found that the brown sugar filling wasn't enough to cover the area I was working with (about 10"x15"). I added an additional 1/2 teaspoon on cinnamon and 1/4 cup of brown sugar. After they were baked, it was judgment time! They came out much softer than I had anticipated but also much more flakier than I'd hoped. I guess I had expected them to be more chewy since the dough was tougher than I'm used to. Overall, they came out really good. They were even baked, soft, not too much filling and just the right amount of sweetness. The caramel sauce? OMG. This stuff is no joke. I made the mistake of drizzling the sauce over the rolls while they were still hot resulting it 90% of it sliding down the sides and forming pools on the parchment paper. Thankfully, once the sauce had cooled, I was able to scoop it up, lay it on top of the roll again and watch it form a perfect shiny glaze over the top.I think next time I may even melt a few chocolate chips into the sauce. I definitely recommend you try this recipe! Thank you Annie for sharing your blog. You are an inspiration to those without a clue how to veganize "normal" food. If you ever decided to put out a print version of your recipes, reserve me 5 copies!!! I will be in Berkeley in two weeks and cant wait to stop in to try one!! They look fabulous! Yay for awesome vegan superhero bakers!